The Tape Measure is a tool for measuring distances, added by BiblioCraft. Right click on any two blocks, and the distance between the two will be displayed as a chat message. The distance includes the two blocks selected. The tape measure has infinite durability. 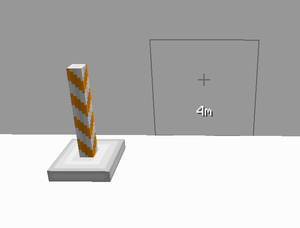 In MC 1.6.4+ versions of the mod the tape measure now has a marker for the starting point and will show you your distance from it on screen, handy for those who tend to quickly forget where the first click was. When you right click again the marker will disappear and your measurement will be relayed to you in the chat window. This page was last modified on 19 May 2016, at 06:16.